1. Gilding by Jane Laferia. Easy techniques and elegant projects with gold leaf. 2. Professional Painted Finishes - A Guide To Art and Business Decorative Painting by Ina Brosseau Marx, Allen Marx & Robert Marx. Contains over 500 colorplates of decorative painting. 3. Gilding, The Glory of Gold by Sue Trytell. A contemporary approach to gilding with instructions for household items. 4. Gilding for the Home - Decorating With Gold Silver and Metal Leaf by Liz Wagstaff. A practical course on gilding with gold,silver and metal. 5. Gold Leaf Techniques Fourth Edition by Kent H. Smith, from original by Raymond Leblanc. The ultimate book in gold leafing instructions. The causes,prevention and solutions to common gilding problems are covered. With the appropriate brushes, you can make a piece of wood look like an imported piece of marble or an expensive type of exotic wood. 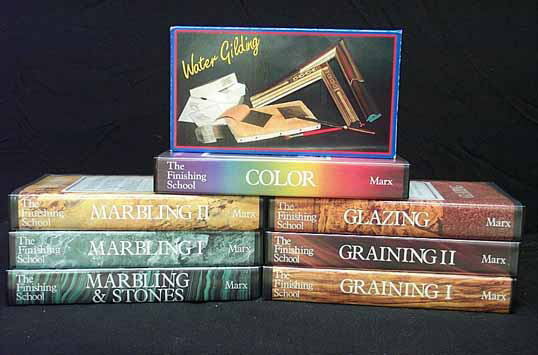 The videos, which serve as a companion to the book Professional Painted Finishes - A Guide To Art and Business Decorative Painting by Ina Brosseau Marx, Allen Marx & Robert Marx, are the equivalent of twelve eight hour days of intensive instruction. Not only do they provide you with step-by-step instruction, they also elaborate on the understanding and analysis of the technique. Water Gilding - [2 hrs.] A new step-by-step video geared toward the beginner, which provides an overview to gilding through explanation and demonstration. ITEM # REVWG Suggested List Price $55.00 (not part of the "Finishing School" series).